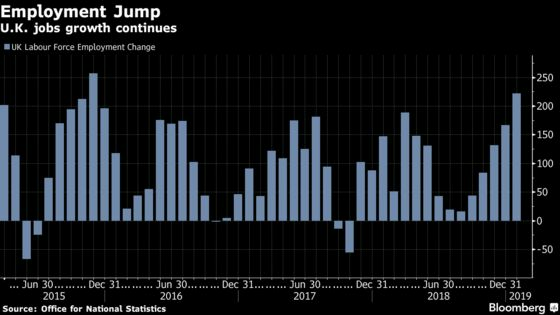 (Bloomberg) -- The U.K. labor market remained in robust health in the three months through January, despite a Brexit-induced slowdown in the overall economy. Employment hit a record high after the biggest jump in more than three years and underlying pay growth maintained its fastest pace in more than a decade as companies struggled to fill vacancies, Office for National Statistics figures published Tuesday show. The jobs market has been the bright spot of the economy since the 2016 Brexit referendum, defying the uncertainty weighing on growth over Britain’s departure from the European Union. The number of people in work between November and January rose by 222,000, the biggest increase since late 2015 and almost double market expectations. It took the employment rate to a record-high 76.1 percent. Unemployment fell to 3.9 percent, its lowest level since 1975, and inactivity reached an all-time low. Wage growth excluding bonuses rose an annual 3.4 percent, a pace last higher in 2008. It means pay is continuing to grow comfortably ahead of inflation, which averaged just 2.1 percent in the period. Total earnings growth slowed slightly to 3.4 percent as a strong October dropped out of the calculation. One explanation for the resilience of the labor market is that firms are hiring workers rather than spending on capital equipment because employment decisions are easier to reverse in a downturn. However, with economic growth having slowed to just 0.2 percent, economists say it is only a matter a time before the labor market succumbs. Surveys may already be pointing the way. The latest PMI reports, for example, show employment is now falling across both the manufacturing and services sectors against a backdrop of Brexit and the weakest global growth since the financial crisis. The Bank of England is expected keep borrowing costs on hold this week and refrain from hiking rates until there is greater clarity over future ties with the EU.